The Western “engagement” on behalf of the Syrian rebels depends largely on the cliché, spread by mass media, that the conflict began with peaceful protests. This piece will focus not on current events, but on the beginning of the revolt (February to April 2011), as the opposition to Assad reacted to repression with massive violence – with their own repression. In the first weeks alone, there were 48 documented fatalities on the side of the police and army. In early October 2012, the UN Security Councill, on Russia’s initiative, found its words for the terrorist bombing in Syria: The council issued a statement that condemned “in the strongest terms the terrorist attacks in Aleppo, Syria, on 3 October, causing dozens of deaths and over 100 civilians injured”. Previously, the Security Council, in Resolution 2042, had only commented generally on the violence of both sides, since the US, the UK, and France had blocked Russia and China’s respective initiatives regarding the bombings. After a parliamentary inquiry by the Left Party, the German government disclosed that, in the first six months of this year , more than 90 bombings were carried out, some with several dead, some with dozens of casualties, like the one on February 10, 2012 in Aleppo. So far, the Western media and governments have implicitly tolerated these attacks, which are a key part of the rebels’ strategy to “drag” armed conflict into cities like Aleppo and Damascus. Politicians like [German Foreign Minister Guido] Westerwelle have even expressed a winking acceptance of it, as in the case of the suicide bombing on the Syrian leadership on July 18, 2012. Westerwelle stated that the terror was simply returning to its source. 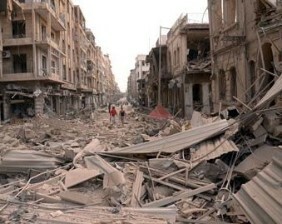 He did not distance himself from the attack, which was claimed by the Free Syrian Army. There was no condemnation, as one would have expected from a government representative bound by the Constitution. The numerous terror attacks, as well as this concrete example, illustrate how far the foreign regime change agenda has pushed Syria away from international law and classical classical diplomacy. If one seeks an explanation for why the West has taken sides so vehemently and in such contradiction to its own values and principles, one soon comes across a justification of the current terror attacks and many other human rights violations. It claims the “actions” of the rebels are just a reaction to the violence the Assad government had used from the beginning. According to this argument, the protests against the imprisonment of several young people in Daraa in March 2011 began peacefully and stayed nonviolent for months – despite brutal repression by the government. Only upon the founding of the “Free Syrian Army” at the end of July 2011 did an armed opposition develop. From this premise, and the mass media image of “Good versus Evil”, the narrative concludes that support for the so-called rebels is justified. This support extends from the dissemination of information by news media advertising; through the training of rebels by former British military in Iraq and Turkey; through financial support from Saudi Arabia, Qatar, and the United Arab Emirates; all the way to weapons shipments. The weapons, meanwhile, even include Stinger missiles, the infrared-controlled ground-to-air missiles that find their target on their own. The US had previously supplied these missiles to the so-called People’s Mujahideen [in Afghanistan]. After the war against the USSR, the US tried to buy back the weapons, which also pose a grave threat to civilian aircraft. It would be unthinkable if the rebels, whose massive support from Saudi Arabia and its anti-Israel orientation also has the Israeli newspaper Haaretz worried, got the idea to shoot down Israeli passenger planes. In the mean time, according to a New York Times report, CIA agents in Turkey decide which rebel groups receive which weapons. The most recent events in Libya, or the arming and disarming of later opponents in Afghanistan, are ample evidence of the Americans’ knack for picking allies. 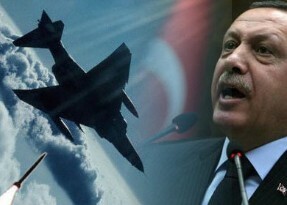 It’s almost farcical when – while substantial training, arming, funding, and operations are carried out through Turkey – Turkey forces Syrian aircraft to land, in violation of international law and under the pretense that weapons for the Syrian army are on board. All the more since Syria and Russia are not subject to the EU sanctions regime, nor is Turkey responsible for enforcing it. 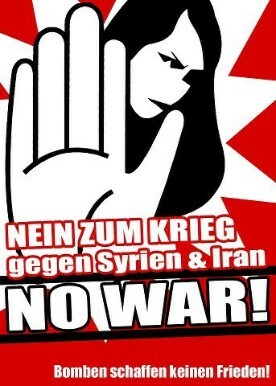 Anyone who thinks this “Good versus Evil” narrative is limited to the dominant mainstream media is gravely mistaken: In recent days, the Left’s state association in Hessen adopted a resolution, which generally describes the leftist consensus [on NATO intervention in Syria], but with the following added on the insistence of Bundestag representative Christine Buchholz: “The Assad regime has tried to militarily quell the popular movement for democracy and social justice – in contrast to Tunisia and Egypt.” Ignore for the moment the fact that this description contradicts the numerous casualties in the latter countries (particularly in Egypt), and therefore trivializes the violence of those states. In Syria’s case, Buchholz’s description is more a product of wishful thinking than it is supported by actual events. Everyone from the bourgeois rightists to the Green human rights warriors perpetuates this image: the peaceful democratic movement on one hand, and the brutish authorities on the other. However, a little research reveals the concrete incidents are not nearly so black-and-white as one would like to think, and as they have been portrayed for months now by Christine Buchholz and the “initiative” Adopt a Revolution. Constant repetition, particularly in the mainstream media, has not made this image any less false. Nonetheless, it has been ingrained in people’s minds as conventional wisdom, legitimizing Assad’s ouster by any means necessary – be it by suicide bombings or a provoked intervention through Turkey (which is to say, through NATO). So it is worth a quick look at the chronology of events in order to reassess how the question of violence and counter-violence really played out in the Syrian revolt. It did not take long for the sparks of protest to jump from Tunisia and Egypt to Syria: The protests were more virtual expressions of discontent, limited to social networks and (in a sense) written into being by Al Jazeera. Hence, the self-immolation in late January 2011 of Hasan Ali Akleh, who followed that of the Tunisian Momahmed Bouazizi, was supposed to be a rallying point for the movement. At the same time, however, it marked a violent beginning. In the course of February 2011, isolated demonstrations drew no more than a few hundred demonstrators. Some were actually directed at Qaddafi. Still others took place outside of Syrian embassies abroad. Al Jazeera lamented that Syria was a “kingdom of silence”. On March 6, 2011, several teenagers, some under 15 years, were arrested for writing anti-government slogans on walls in the southern Syrian city of Daraa, near the Jordanian border. (The incarceration of teenagers is also common practice in the US, for example, albeit for more serious offenses as well, as the Bureau of Investigative Journalism recently reported.) But this action, like the prisoner hunger strike or Kurdish demonstrations, did not trigger a broader protest movement. On March 15, the so-called “Day of Rage”, the first noteworthy demonstrations finally occurred in Al-Hasakah, Deir ez-Zor, Daraa, and Hama, in which a total of several thousand people took part. In Damascus, a city of 1.8 million people, a march of 200 men grew to around 1,500 demonstrators. Up until this point, there had been hundreds of arrests – Al Jazeera and activists claim thousands, an unrealistic count given the apparent number of demonstrators – but no documented fatalities. Nevertheless, it is claimed for the first time that the movement has “martyrs” to avenge, though without any corroborating evidence. Following these reports, it seems the government’s unexpected concession was met with the first killings of police by demonstrators who had already brought weapons with them, apparently with the intention of using violence. The incidents in Daraa indicate that the narrative of supposedly nonviolent protests (that the government immediately put down with brute force) belongs to the realm of fairy tales. Indeed, on March 22, 2011, UN Commissioner on Human Rights Navi Pillay requested an investigation of the killings of six demonstrators in the same month, but wasted no breath on the slain police or the appearance of “armed protesters”. She even spoke of “peaceful demonstrators”. By doing so, she both exploited the victims and prejudiced the Western reading of events. On April 5, 2011, Reuters reported two police in the Damascus area were shot dead. Three days later in Daraa, according to The Guardian , at least 20 “demonstrators” and 19 police died in riots. On April 9, 2011, reported Al Akhbar, unidentified shooters in Baniyas killed nine soldiers on their bus as they were traveling. On April 14, 2011, also in Baniyas, a sniper killed one soldier and injured another. Four days later, an army General, along with both of his children and his nephew, were murdered by an armed group in Homs. According to the medical examiner, their bodies had been mutilated with sharp objects. On April 19, 2011, the government agreed to ease the emergency laws – a demand of the protest movement. On the same day, an air force pilot was murdered in front of his house in Homs by an armed group. In addition, a funeral in Daraa devolved into a clash that killed eight people, including five security officials. Just these cases documented by Western media – presumably, the actual number is greater – show that from the start, it was not only the police that used violence and the opposition that reacted. Rather, they prove that the so-called opposition movement (on its own initiative) carried out assassinations, torched buildings, and attacked army posts and units. The “popular movement for democracy and social justice” (Christine Buchholz) was not, at any time, a movement of the majority of Syrians, though the expression “popular movement” invites that conclusion. On the contrary, it was the movement of a minority that, from the start, did not shake off its founding mistakes. Namely, the movement has embraced unrestrained violence and failed to distance itself from clearly criminal and terroristic methods. Thus, the “movement” itself has contributed to the militarization of the conflict, which continues to intensify (and is explored further in the piece From protest to armed revolt). It is in this context that the events surrounding the massacre of el-Houleh (Houla) one year later can be understood.